A few weeks ago, I had the opportunity to sit down with Gov. Ralph Northam and a small, interfaith group of religious leaders for a Passover seder at the Executive Mansion in Richmond. Passover is the Jewish holiday commemorating the biblical story of liberation for the Israelites enslaved in Egypt. As the festival begins, it is customary to have a Seder, a special celebratory meal bookended by prayers, symbols, and conversation. From what I know, this was the first such Seder to be held at the Executive Mansion. It was the initiative of Northam and his wife Pam. The Northams aren’t Jewish. The idea to host a Seder was borne of a genuine desire to learn more about the Jewish tradition and to reach out to minority religious communities. In attendance were Baptist and Episcopalian ministers, a Muslim Imam, and a Hindu scholar, along with spouses/partners, a few Jewish members of Northam’s staff, and a couple of the Northams’ Jewish friends. There were no reporters, television cameras, or press releases, and the invitation list was kept deliberately small (just 16 of us). This was not designed as an opportunity for public relations, rather it was to create a space for meaningful conversation among people of diverse religious backgrounds. Our dinner conversation focused on the Seder’s radical proposition that,“In each and every generation, a person is obligated to see him or herself, as if he or she personally left Egypt.” I invited participants to understand that statement, not as a narrow Jewish commandment, but a universal invitation to view our current circumstances through the prism of the Exodus story. If we were to do that: What would be Egypt? Who would be Pharaoh? Who are today’s Israelites? Who is oppressed, and why? Who is in need of redemption, and how might they be redeemed? And what is our overall role in the drama? Many participants drew a connection between the subjugation of the Israelites and the modern African American experience. This conversation was prescient and emotional, especially considering that Stephon Clark, an unarmed black man, had just been killed by Sacramento police officers a few days before our gathering (all he had in his possession was a mobile phone). Coincidentally, the Seder also coincided with the 50th anniversary of Martin Luther King, Jr.’s assassination. King, a modern-day Moses, frequently connected the struggle for Civil Rights with the Exodus story. This loomed large over the evening. The Parkland school shooting and the recent activism surrounding gun control – powered by young people – was also fresh in many of our minds. Many of the participants at the Seder connected the pervasive fear of gun violence with the terror engendered by volatile Egyptian taskmasters. Our Muslim participants also spoke passionately about their experiences with anti-Muslim bigotry – views now tragically being championed at the highest levels of the US government. It was not hard to draw a link between the modern marginalization of American Muslims and the ancient Israelites, both of whom were targeted because of their religious and ethnic backgrounds. Northam, an outspoken advocate for racial justice, tougher gun laws, and inclusive policies seemed moved by these analogies. However, as these conversations were unfolding, Northam rarely spoke. Instead, he listened intently to what each of us had to say. At one point, he acknowledged his silence. He explained that, growing up on the Eastern Shore, he was not exposed to much diversity, and even harbored unconscious prejudices about the people and communities he didn’t know very well. Over time (and, in his view, with Pam’s guidance), he came to understand that his position of social privilege as a white Christian man required him, first and foremost, to listen to and learn from the experiences of those from different backgrounds. In so doing, he could see their common humanity and empathize with their challenges, enabling him to be an ally and an advocate for those individuals and communities. Unsurprisingly, President Donald Trump cast a large shadow over the evening, with some participants identifying the President with the Pharaoh of the Exodus. Others were more cautious, but nevertheless saw clear parallels between the increasingly oppressive regime of the Exodus and the tyranny seemingly growing in our own time. If true, then our role in the story ought to be standing with the oppressed, resisting despots and despotism, and championing liberation. The conversation, however, wasn’t merely an opportunity for political finger-pointing. Instead, as we discussed the relationship between the Exodus and current events, many of us, including Northam himself, candidly noted the ways in which we have contributed to the brokenness of our world. Interestingly, in one particular telling of the Exodus story, the Pharaoh is not even mentioned. My fellow dinner goers were quick to point out that it was the average Egyptian, and the Egyptian people, and not necessarily the Pharaoh, who was responsible for abiding, benefiting, and perpetuating the centuries-long enslavement of the Israelites. The moral of this story? We, too, bear responsibility, if not guilt, for the oppression that endures in our free society. Similarly, despite the Bible’s acknowledgment that courageous women were central to the Israelites’ liberation, women are largely missing from the traditional Haggadah, the book that lays out the Seder’s rituals. We acknowledged the ways in which women are too often invisible in our society and how we still shamefully silence their voices. We also noticed that Moses was absent from the Haggadah. We reflected on the possibility that this was inviting us to remember that we should not wait for a Moses to appear to save us. Any of us could be a Moses. We just have to step up in defense of the vulnerable, demanding that the Pharaohs of our world set their enslaved subjects free. In the end, I walked away from this experience with a profound sense of hope: that we have political and faith leaders who are genuinely interested in understanding different perspectives and bringing people of diverse backgrounds to the table. The fact that we can honor and learn from our differences and that my ancient faith can enrich the lives of people from very different backgrounds is significant. It is also significant that their perspectives can transform my understanding of my own tradition. Perhaps all we need in these bitter and divisive times is for everyone to have a place at the table. That, and perhaps a few matzah balls. The Great American Solar Eclipse of 2017 is upon us. Cue religious hysteria, ancient prophecies, and visions of second-sight doomsday divinations. All of this and more will be visible to the naked eye on August 21, as the sun disappears behind the moon for a grand total of two minutes and 23 seconds. Solar and lunar eclipses happen every 6,585.3 days, roughly translated: Every 18 years. Scientist refer to the time between each eclipse as the ominous sounding Saros Cycle. Observers estimate that first contact with the eclipse will be in Oregon around 10:15am Pacific Time, eventually following a path that will cut through 12 states including the Southern states of Tennessee, North Carolina, South Carolina, and Georgia. Those are just the best vantage points, however. It is expected that every single man, woman, and child in the Continental US will see at least a partial eclipse since the Moon will be covering around 48 percent of the Sun’s total surface. Richmond and Hampton Roads are estimated to see close to 85 percent of the total eclipse (of the heart) starting at 1:15pm. What does this mean for Richmond watchers? 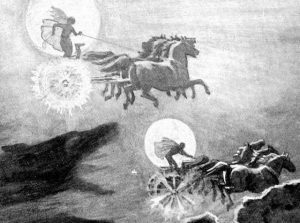 The sun starved Northman of Scandinavia believed a sky-wolf named ‘Skoll’ stole the sun causing an eclipse that would usher in the Viking apocalypse known colloquially as Ragnarok. The Vikings would then attempt to steal the sun back by making a raucous uproar eventually scaring Skoll into giving up his delicious solar meal, thus bringing the world back from the brink of darkness. The Tartars are a people who inhabited parts of Western Siberia and believed a vampire tried to consume the sun – only abandoning his quest for blood soaked solar dominance when he burned his tongue. The ancient Koreans believed that there was a king from the ‘Land of Darkness’ who deployed fire dogs called Bulgae to abscond with the sun. This great astrological caper was a way for the king to brighten his otherwise gloomy domain. According to the mythology they always fail, but whenever these cataclysmic canines try and take a bite out of the sun – a solar eclipse results. An ancient Indian poem titled, Mahabharata, details the saga of the poor demon Rahu – more specifically – the head of the demon Rahu. According to the poet, this evil incubus stole a taste from an immortality potion (we love a good potion at RVA Mag). Outraged by this crime, the Sun and Moon reported him to the god Vishnu who promptly decapitated him before the potion could take effect. 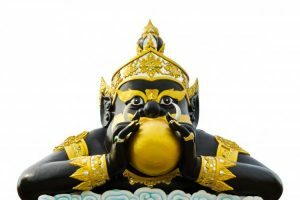 As a result, only Rahu’s head became immortal and with a never ending grudge against the Sun and Moon, he swallows them whenever he catches them causing a, you guessed it, solar eclipse. But since he is only a decapitated head and has no throat, they always slip out the other end, ending the solar eclipse. There is one word that can best describe the Aztec feelings toward solar prophecies: Blood. They believed the Moon was an abominable deity who attacked the Sun, and if the attack was not repulsed via blood sacrifice then the Sun would disappear forever and the world would come to an abrupt end by being consumed in darkness. 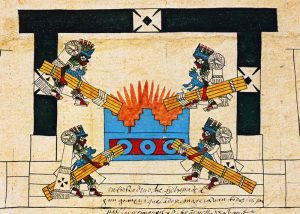 To prevent this eventuality, the Aztecs would conduct a ‘New Fire Ceremony’ in which all fires were extinguished and a man would be sacrificed by having his heart removed atop a dominant volcano. Should your boss still disagree with your portentous feelings on the solar eclipse and deny you an afternoon off to appease the gods, here is a link to the ACLU in Virginia.